Busy, Busy, Busy is the title of this post for good reason. Students are back and we are in the full swing of things. Today was the first big harvest to be distributed to many greek accounts and dorms. This is the moment we have been working towards since last spring. The weather has cooperated and it is finally HOT, which means…. tomatoes and peppers are coming in faster than we can get them out. Oh, did I mention I am also cooking for a fraternity. We are working on cloning as we speak :). Thirteen hour work days are completely worth while once you see that smile on a clients face because he just ate the best cherry tomato he has ever had in his life (which happened all day)! It is amazing to experience the buzz and excitement throughout the company, not to mention the demand, of fresh produce from OUR farm. All of the apprehension of moving the produce is now gone and I am trying to convince my boss that a 1/2 acre is not enough to meet the demand. LOL, might be a different story at the end of this growing season when I finally get a day off. Upward and Onward I say!!! We have had some exciting things happen since my last post. I must mention that it was very nice of my friend/ coworker Adam to step in and take over for a week. Jeff Kindhart, my farmer friend and mentor from southern Illinois, came up this past Thursday. Every time he makes a visit it is such a treat (even though I frequently have to remind him my background is in culinary arts and not horticulture), especially when he gives me the “duh” look :). I was lucky enough to meet Jeff through the Beginning Farmers program. He is such a great guy to know. Not only does he provide me with loads and loads of knowledge but he also introduces me to techniques I don’t have the means to apply myself. He and his assistant Julie came Friday and steamed my beds. 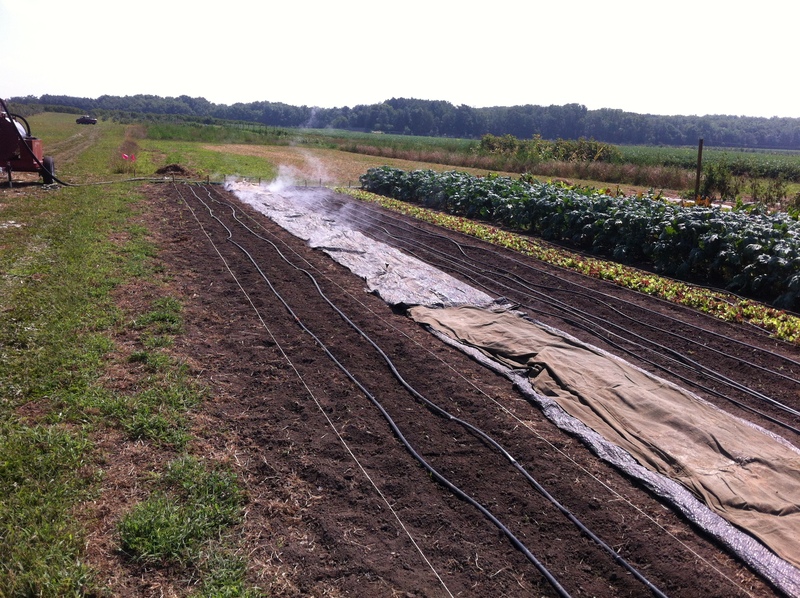 I am beginning to plant for the fall and Jeff introduced and demonstrated a steaming method to prevent weed growth. No weeds you say?? Yes please! Kevin and I spent roughly 85% of our time on our hands and knees weeding the lettuce and spinach beds so they would be clean for harvest. Kevin is not one to complain but I nearly thought he was going to kill me after the 13th hour with our backs aching! Needless to say, we are very excited about this and look forward to the bountiful weed-free harvest in 4-6 weeks. Reflecting on what a great summer this was, I have to end this post as a small “ode to Kevin”. I can not explain how hard it is to find good people to work with who are invested in the goal, work hard and never complain (even when your ocd leader is driving you crazy). Not everyone wants to wake up at 5:30 in the morning and do back breaking labor all day in the hot sun. It was especially nice doing all of this with a friend. Kevin has gone back to his fraternity to cook but is volunteering every chance he gets. I dropped produce to his house today and overheard him talking to some of his clients about how he planted those seeds, weeded, watered and cared for the product that arrived at his door. He said it with such enthusiasm that this twenty year old client actually lit up when he heard he was going to be eating kale. KALE!!! What twenty year old college kid says that?! Bravo Kevin for making my dream your dream and helping me every step of the way! You will be sorely missed and I am disappointed I will have no one to serenade cheesy 80’s music to. It seems as though Christmas has come four months early. As Kevin and I were harvesting tomatoes and peppers this morning we noticed that we received two presents from mother nature. The first gracious gift is that the new growth on the plants affected by the bacterial leaf spot is lucious and green. It seems that, not only is the copper hydroxide working, but also we have received dry warm weather which is inconducive to the spread of the bacteria. Of course after seeing this Kevin and I immediately started singing the Rocky theme song…”Trying hard now. It’s so hard now. Trying hard now. Getting strong now. Won’t be long now. Getting strong now.” Can you tell I grew up with two brothers and a father who loved Rocky and Star Wars :)? Although this is great news and very exciting, I understand that things change at an incredibly rapid pace on our little piece of land. For now I think I will ride the tomato and pepper high. Zack Grant, the farmer at the U of I SSF spoke Saturday about the importance of researching and buying disease resistant varieties. As a beginning grower, I did not understand this before I planted. Coming from a culinary background, I wanted to grow what I love to eat. 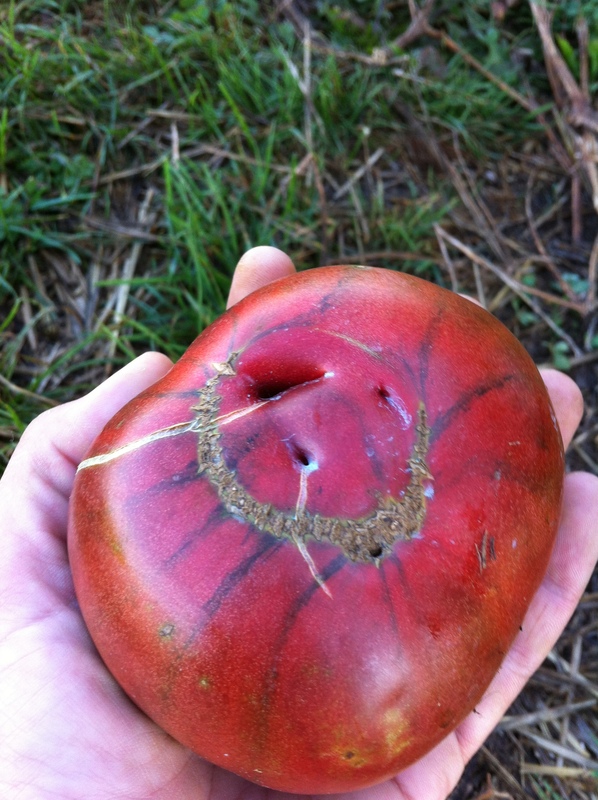 I know that heirloom tomatoes taste better to me than the traditional beefsteak. I also know that I would rather eat a Carmen pepper than a green bell. As we are thinking of forward expansion and acquiring more land, I realize that this is definitely an aspect of growing that needs to be taken into consideration. The beefsteaks and bell peppers that I am growing have had a better success rate so far than the heirlooms. I will tell you that Kevin and I would rather eat a Purple Cherokee with cracks than a perfect looking Mountain Fresh. We may be a little snobbish though. The second present we received from mother nature is that our vegetables are finally turning. This is again because mother nature has decided to cut us a break. With the warm weather we have received over the last week it was just enough to push the turn from green to red. 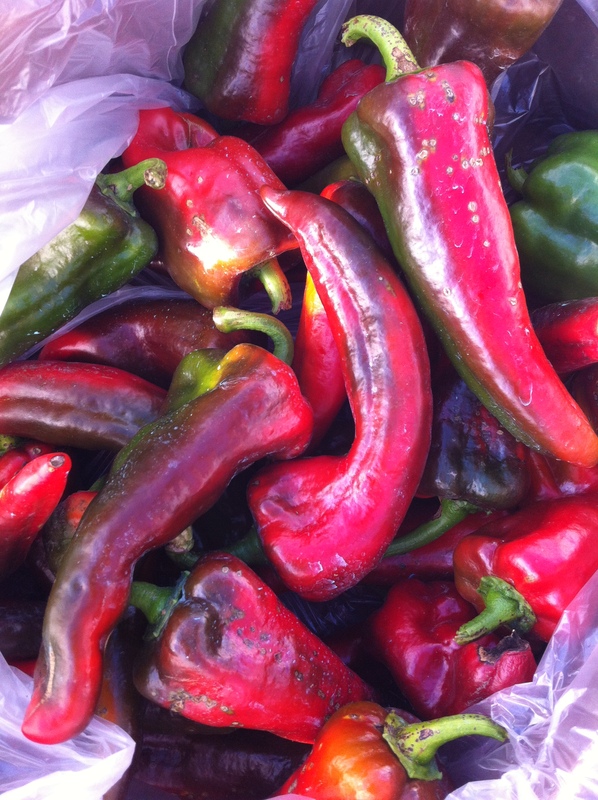 We had our first successful harvest of Carmens and Mercato peppers this morning. This was after 3.5 weeks of biting our fingernails, wondering if it was ever going to happen. They were beautiful and vibrant. In between the raised beds and our other beds, Ann planted buckwheat as a cover crop. She picked buckwheat specifically because it flowers and encourages bees to pollinate the other crops. Hello, Summer? It’s me, Ann. Hello, Summer? It’s me, Ann. I was just wondering when you were planning to arrive this year? While this cooler weather may bring some reprise from last year’s “off the chart” temperatures, it is creating a bit of an impatient waiting game for Kevin and myself. We have had peppers and tomatoes on the plants for weeks now and it seems like they will never change from green to red. 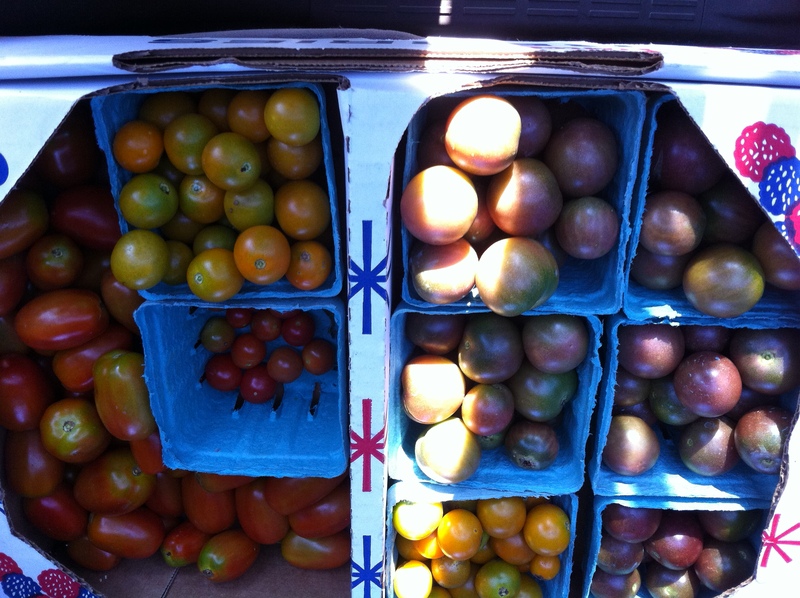 We did get a very nice harvest of cherry tomatoes, vibrant green bell peppers, kale and chard this morning. As I was doing my daily routine of walking down the beds whispering sweet nothings to each of the plants in the hopes they would produce more, I noticed unsettling scabby looking spots on a lot of my tomatoes. Now, after the total destruction of the basil I have become more than a little paranoid. I immediately went to the U of I student farm offices to figure out the problem in their disease and insect books. I identified it as Bacterial Spot. Dum dum dum dum da dum dum da dum (to the tune of the Imperial March from Star Wars). 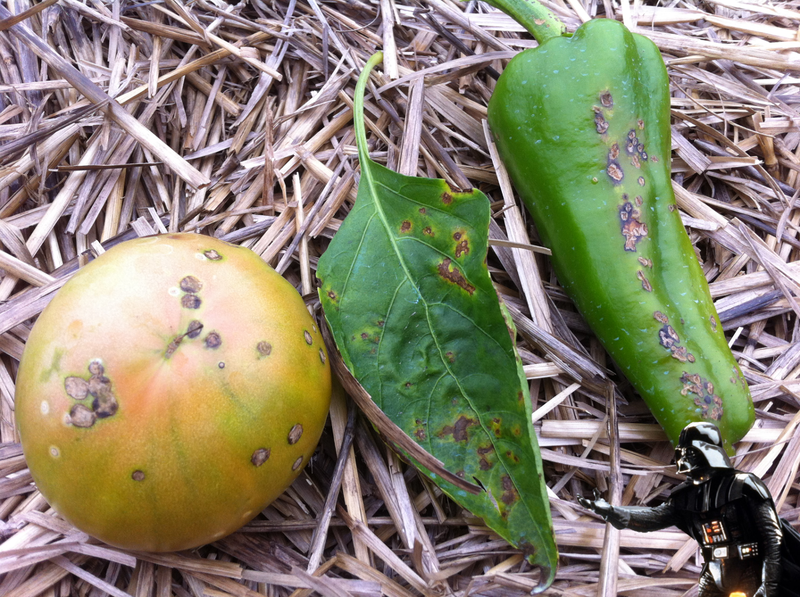 Apparently we were unlucky enough to catch a strain that affects both peppers and tomatoes. We have been treating the peppers since early July with copper hydroxide and we started treating the tomatoes in mid July because I thought we had early signs blight. (If you have ever tried to identify soil-borne or foilatge disease you will know that, for the most part, ALL OF THESE DISEASES LOOK EXACTLY THE SAME!) It doesn’t seem that the copper hydroxide applications are working but since there isn’t much else we can do, we will keep applying and hope things will turn around. My boss keeps reminding me that this is the first year and we should use it as a learning project. Well, I have definitely learned that growing organically is very very very hard. I have also learned that the amount of hard work you put in really has very little to do with the success of your crop. The success of the crop has more to do with weather, soil, experience and sheer luck. Next time you walk by that beautiful vegetable at the co op or farmer’s market, take extra care when preparing and handling. “Always end on a good note” they say…. well, Kevin and I got the first fall planting completed and irrigated. Our bush beans, which were planted a little over a week ago, are about 2″ tall and our salad mix, which was planted on Thursday, is already starting to come up. We got our spinach in the ground today and are so excited to see growth next week. Mother nature has finally decided to cut us a break… at least in the pest department. As I was harvesting our kale, I noticed white egg sacks on the back of some of the kale leaves. At first I began to panic, thinking “great, another battle to wage Braveheart style”. At the moment I was devising my attack plan, Rick Weinzierl stopped by to see how I was doing. Not only is he the head of the SARE program I am in, but he is also an entomology professor at the U of I. Apparently the white sacks are Braconid wasps that have laid eggs in the pesky cabbage worms that have been threatening to destroy our beautiful kale. These wasps do not cause damage, other than the destruction of their hosts. Also, they are not harmed in any way when we apply the weekly application of BT. It was amazing for me to learn about the existence of these insects and they have now become my new best friends. Kevin and I are trying to be patient while we wait for warm weather to cause our sweet Italian peppers and heirloom tomatoes to ripen. 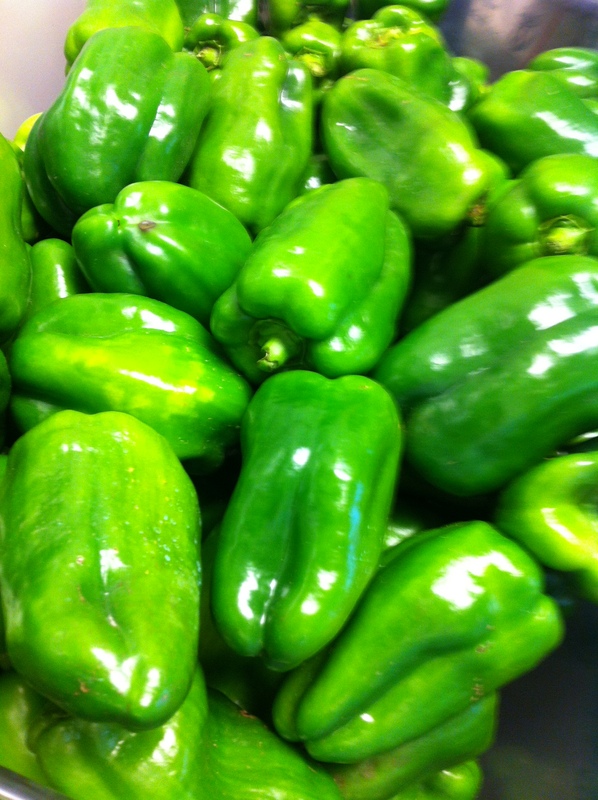 We were very excited to bring in our first 48 pound harvest of green bell peppers on Monday. The wonderful aroma was overwhelming and if I had not been so full snacking on green beans and black cherry tomatoes, I would have eaten at least four. We are preparing for the fall school year and trying to estimate and devise a planting schedule so that each pound of produce has a home, whether it be out in our greek accounts and/ or at Hendrick House, Presby and Armory. I am ecstatic about planting again and wish this rain would hold off so that we can have time to work the ground and get the seeds in so there is HH farm lettuce and spinach available when school starts.